ESPN's handling of the Mike Rice-Rutgers story has been superb, but there is one sticky wicket for the network – the presence of college basketball analyst Bob Knight. Knight is an expert not just in the college basketball realm, but in the realm of abusing his own authority and physically abusing his players. In 1997, Knight choked Neil Reed during a practice and after video emerged years later, it was an integral piece of evidence that eventually led to Knight's firing from Indiana. Nobody in their right mind would think ESPN would bring on Knight, who has played by his own rules in the past, and ask him about his opinion on the Mike Rice story. It'd be a horrible self-inflicted wound for Bristol. The only sensible path for ESPN is Bob Knight staying as far away from ESPN airwaves as possible until the story dies down. 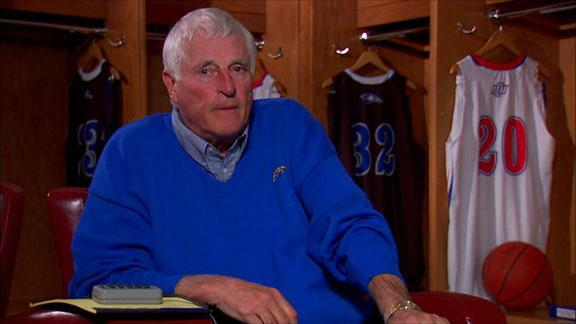 Via @shaunwyman: Bob Knight will be a guest on ESPN Radio's Mike and Mike at 7AM ET on Thursday. Said Mike Rice Qs will be asked. Bob Knight has canceled his scheduled appearance on Mike and Mike tomorrow. ESPN says he has declined comment on Mike Rice. Naturally, this flip flop creates the impression that ESPN is protecting Knight and hiding him away until the story dies down… which is obviously what they should do as a network. Having Knight comment on Rice would only create chaos and controversy in and of itself. Nevertheless, this awkward situation provides skeptics and critics of Knight and ESPN with plenty of ammunition and a valid critique of his employment as an ESPN analyst. If he has to run and hide anytime a negative story about a coach abusing his power arises because it hits too close to home, that should call into question why he's even there in the first place.